The 3x25 Blueline Opera Glasses with Necklace from Barska are lightweight stylish binoculars designed to help you feel closer to the stage. Fully multi-coated optics transmit bright contrast-rich images even in dim lighting conditions. The 3x magnification is ideal for enhancing details of the performance, making you feel closer to the action while still maintaining awareness of the entire scene. 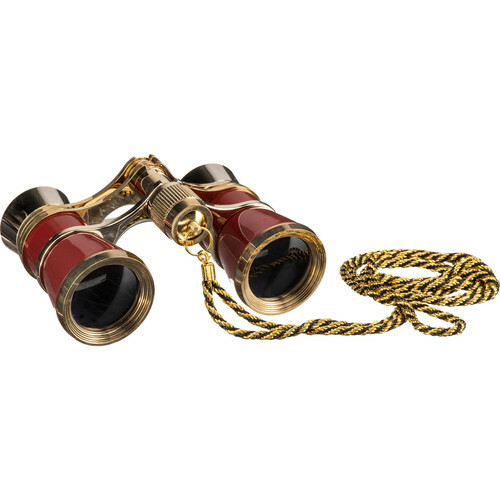 These opera glasses feature a stylish polished brass finish and include a drawstring leatherette pouch for safe keeping. A gold-trim necklace and grooved center focus dial provide a comfortable viewing experience for observers, whether seated in the front row or the mezzanine. Fully multi-coated optics transmit bright contrast-rich images even in dim lighting conditions. 3x magnification is ideal for enhancing details of the performance while still maintaining awareness of the entire scene. Features a stylish polished brass finish and includes a drawstring leatherette pouch for safe keeping. A gold-trim necklace and grooved center focus dial provide a comfortable viewing experience. Box Dimensions (LxWxH) 5.0 x 3.6 x 2.2"
3x25 Blueline Opera Glasses with Necklace (Red & Gold) is rated 5.0 out of 5 by 1.